It’s the biggest, fastest public wifi project on Earth: Starting today, New York is unveiling street-side internet hotspots that will blanket America’s biggest city and provide unprecedented wifi access to over 8 million people. 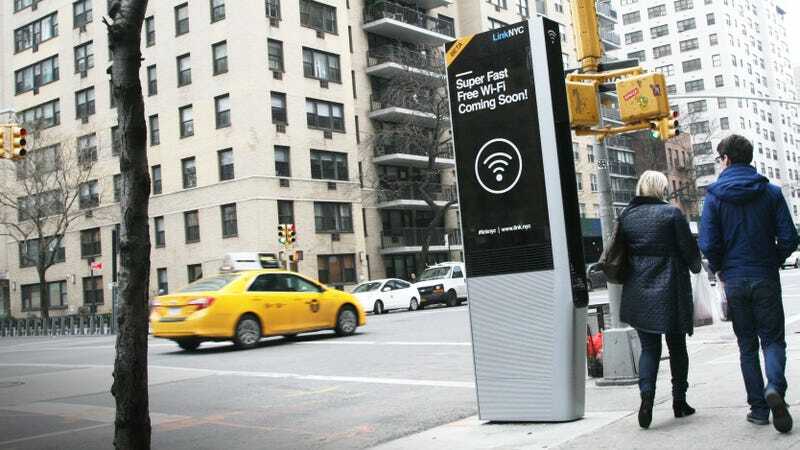 It’s called LinkNYC, and each “Link” is a nine-and-a-half-foot tall futuristic mini-monolith that beams wifi signals to all. (Each Link also used to be a payphone which is fun.) That means no more ducking inside the nearest Starbucks and being guilt-tripped into buying a latte, or venturing into a public library when you’ve hit your data limit for the month. In 2014, the de Blasio administration started looking for a company for help bringing this all to fruition. It picked CityBridge, a media and tech consortium, to devise a plan that’ll bring 7,500 gigabit-speed units to all five boroughs in twelve years. Today, the city will literally pull a veil off of the first two Links—which are already installed in the streets of Manhattan but covered in veil. In the next week or two, they’ll open up to the public for actual use. One’s located on the corner of 15th Street and Third Avenue; the other, at 17th and Third. The city hopes to have 500 of these Links in place by July, aiming to install ten a day. To say this is a massive undertaking is a massive understatement. It involves hundreds of miles of brand-new, purpose-built fiber optic cable, and while your exact speed will vary depending in your device, LinkNYC delivers connectivity speeds of 1,000 megabytes per second, which the project says is 100 times faster than average public wifi in the US. They want to place each unit roughly around every 150 feet from each other, and each has a signal radius of up to 400 feet. Here’s how it works: Pedestrians can huddle around the wifi tower (the same size as a bus stop) and connect to the network. Nestled on the side of each unit, in between the two video screens that play ads, is an Android tablet. At first, it will handle basic features, like mapping and internet browsing, but developers are invited to build more apps for the platform over the coming years. The city’s partnering with Vonage to also allow free calls anywhere in the US to LinkNYC users. You can make video calls using the tablet. The downside is that it’ll be very public—everyone can see, and hear, your conversation. But simply plug in your earbuds or headphones to make it more private. Each Link also offers two USB chargers for charging your device on the go. And like any wifi network, it remembers your device, so you can leave NYC for six weeks, come back, and seamlessly have instant wifi back on your phone on your walk to the office, even after an extended vacation. You’ll also notice the very prominent, red 911 button that lets you make emergency calls for free. The team told members of the press on Monday afternoon that it’s working with the NYPD and the engineers to avoid any prank calls or accidental 911 calls. This means, for example, configuring the phone’s keypad buttons to respond only after being pressed for a certain time or sending back prompts to double-check with users if they’re really in an emergency. Speaking of ne’er-do-wells: The team told us that, even though nothing is vandalism-proof, the scratch-resistant screen is built to last. And since the units take advantage of the holes from the existing payphone infrastructure, they’re built pretty firmly into the ground. New York City has also considered loitering. To prevent people from staying too long, there are no flat surfaces anywhere on the unit. That means there’s nowhere to stick a Burger King cup or to sit down like you own the place. And even if 500 people decide top congregate around a Link and stream Netflix movies? The team says the gigabit wifi can handle it, but they also doubt that people would be doing that. Of course, the system might need special rules in densely populated areas like Union Square, but generally, the city isn’t expecting people to camp out for hours on end in front of these things. They’re expecting quicker sessions, like checking email or verifying a restaurant location. None of this comes for free. The project has a price tag of $200 million, with investors that include Qualcomm, CIVIQ, and Intersection. Instead of the city subsidizing the payphones of yore, each unit has big video screens on either side that’ll play digital ads, which will help fund the installation and maintenance costs for the Links themselves. Each Link is manufactured in a factory in Long Island City in Queens. Each unit is modular, and different parts of it can be replaced and repaired of upgraded, in an effort to future-proof each Link. The team also says that each unit is weather-proof and can handle all of Mother Nature’s assaults, from blizzards to flash floods to hot summer days. You may be freaking out about, well, the security of this extremely public, widely-used internet portal. You’re sharing a wifi network on the streets of New York City with potentially dozens of strangers—what could go wrong? Well, the team says the network offers encryption, so you don’t need to worry about your private information being slurped up and sent to advertisers. CityBridge says that it’s worked with the mayor’s office to devise a privacy statement that forbids sharing users’ personal data with any third party. This is clearly a game-changer for New York—the same city that’s been criticized for being such a huge metropolis of global importance, and yet often falling flat in some tech respects, like wifi on the subway. But with LinkNYC, the city’s taking a big step toward the commodification of the internet. Goodbye, collect calling on payphones. Hello, future.